See an A to Z of all Artists photos on this site! Tapping into a multitude of influences, from Willie Nelson and Johnny Cash to Blind Lemon Jefferson, the wide open Fenlands and the frenetic buzz of London. This is a masterclass in songwriting, showing off the talents of bluesy Americana stalwart Brooks Williams and cult British singer-songwriter Boo Hewerdine to full effect. Playing here with Whippersnapper at Fylde in September 1987. This photo of Dave and Lars was taken prior to Dave's show with Martin Carthy at Bury Met in January2008 and was used as the cover of the 'Accompanying Dave Swarbrick’ dvd. Seen here during his 'Sam Sweeney's fiddle - Made in the Great War' tour in 2015, these photos of Sam and his friends Robert Harbron, Paul Sartin and Hugh Lupton were taken during the short set prior to the main show. One of the most exciting bands I've seen in ages, this North West based band with their own brand of Jump Jive, Blues, Boogie and Western Swing could perform at any Folk, Jazz or Country Music event and go down a storm. If you've not caught them yet you don't know what you're missing, get your dancing shoes on and look them up! July 2007 brought a new look Swing Commanders to the Hobo's Retreat with Peter and Gaynor from the original band being joined by The Laverne Sisters and Simon Brady on stage. Whilst the personnel had changed the music was as infectious as ever and a great night was had by all! January 2012 sees Siena Lloyd joining Peter, Gaynor, Simon and Mark on stage on vocals, saxophone, clarinet, piano and double bass. They continue to be a stunningly vibrant and versatile group that performs an exciting mix of 1940s classics, boogie-woogie, western swing, 50’s jump jazz and more! The wonderful interpreter of both contempory and traditional material seen here at Swinton Festival in 1990 . Heidi Talbot, former lead singer with Cherish the Ladies occassionally forms a terrific partnership with Kris Drever, a solo artist with an impeccable folk pedigree,he is the son of singer-songwriter Ivan Drever, formerly lead vocalist with Celtic rock supremos Wolfstone. Two excellent musicians performing lilting, lyrical folk music together. Heidi's voice combined with Drever's accompaniment on the guitar is quite simply stunning and on this occasion they were joined by John McCusker. One of our best songwriters, John is seen here in November 2005 where his set included a number of songs from his latest album 'The Reckoning' completing his trilogy which started with the award winning 'Unity' and continued with 'Home', each one should be in your collection! I first saw John in his days with Home Service and since then have seen him time and time again and never beeen disappointed! I first saw the Tannahill Weavers at Chorley's July Wakes festival in the late 70's where I was blown away by them, particularly their young piper. They're seen here in 2009 still delighting audiences, a Scottish treasure. Another artist making a final visit to Westhoughton Folk Club in November 2007, Allan has been a great favourite at the club since his first visit in 1972 and the appreciative audienec were treated to songs old and new to represent his many visits. For more photos follow the picture link. One of Britain's finest singer/songwriters. This photo was taken at the Horwich Folk Festival in March 1983 in between helping out with George Butterworth's Leather Stall. For more recent photos follow the picture link. Despite his songs being sang and recorded worldwide, Richard Thompson remains 'one of modern music's best kept secrets'. Seen here at Leeds in the early 80's, Richard remains one of my favourite singer songwriters. Kathryn is a composer and performer whose work is deeply connected to the landscape and people of Northumbria, in particular the North Tyne Valley where many of her relatives still play traditional music. Since her first album release in 1986 she has toured extensively throughout the UK and abroad. As well as composing her own music she has collaborated with artists as diverse as Sting, Andy Sheppard and Sir Peter Maxwell Davies, to name a few. She is pictured here with her band in October 2008. Steve Tilston and Jez Lowe, two of the UK Acoustic/Folk scene’s finest songwriters join forces for a series of concerts filled with songs and music, chat and banter and intimate insights into their approach to their craft. Another couple of youngsters on the scene. Joe Topping's own songs are well crafted, just listen to his cd 'Take Me Home' where he's backed by the likes of Chris While, Julie Matthews, Chris Leslie and Maartin Allcock, whilst their instrumentation and vocals would put many 'better known' acts to shame. Give them a chance! Juliet Turner has been a part of the Dublin music scene since she started recording in 1996. In the course of her career she has opened for such artists as Bob Dylan, U2 and Bryan Adams and toured with Roger McGuinn, Joan Armatrading and Brian Kennedy. In August 1998 she Julie Miller's "Broken Things" at the memorial service for the victims of the Omagh bombing and has won a number of awards since, give her a listen. The Unthanks are the modern face of British folk: young, vibrant and funny without sacrificing or trivialising any of the traditional subject matter or medium, they are undoubtedly one of the most essential live acts currently performing in UK. Mike Innes is a professional Storyteller from Glasgow. As 'The Wandering Vagabond' he has spent several years travelling Scotland and entertaining audiences, young and not-so-young, with tall tales and stranger stories, frequently combining folklore & world mythology with his own, broad knowledge of history, anthropology and the natural world. The only photo that I managed to take of this folk institution at Fylde in September 1982. Norma Waterson, Mike Waterson and Martin Carthy. Martin Carthy, simply the finest singer/ guitarist the English folk scene has ever produced, Norma Waterson, a breathtakingly powerful singer of traditional songs and her brother Mike Waterson, one of the great interpreters of English song and a fine songwriter himself, are seen here supporting Peggy Seeger in May 2008. Norma Waterson and Eliza Carthy are national treasures - two of the country's finest exponents of traditional song, both endowed with rich, distinctive and authentic voices. The mother and daughter combo effortlessly engage new audiences and admirers across two generations with a combination of warmth and humanity, and that intangible, immense 'blood harmony' potency which leaves the hairs standing on the back of the neck. Chris and Julie met in the Albion band in 1994 and quickly formed a part-time duo, touring in Canada as The Women Of Albion. After leaving the band in 1997 they began their full time duo career, releasing their debut album Piecework that year followed by Higher Potential in 1999. They have gone from strength to strength and regularly tour, you must catch them. After 2 hugely acclaimed albums with brother Olly Knight, Marry has teamed up with well-respected singer-songwriter/guitarist David A.Jaycock and released critically acclaimed ‘Two Wolves’ on the One Little Indian label last year. Daughter of Lal Waterson (from legendary English Folk group The Watersons) Marry’s music is steeped in the English tradition, but it is all original and has attracted some incredible acclaim. Having enjoyed many great nights listening to Chris over the years, from her 'solo' shows in the North West's Folk clubs to the bigger stages as part of the Albion Band and with Julie Matthews amongst others, it was great to see her finally performing with daughter Kellie producing the type of harmonies that only singing together for many years can produce. Following in mum Chis' footsteps Kellie has performed with The Albion Band, e2K and more recently The Reel and Soul Association as well as performing solo. Another young talent to look out for! Having seen Wild Welsh Women, Roam and Bill Jones recently there's still great talent emerging on the Folk scene. Taken here at Fylde where WWW blew me away. Their CD "Isle of Mon" has been constantly played since, seek it out!. Follow the picture link for individual shots of the band. Once seen never forgotten the superb Wilson Family taken at Fylde in September 1995. Individually Kathryn and Neill are great but together they are superb, they first met at the Daughters of Albion concert where they had been paired to perform “The First Time Ever I Saw Your Face”, they just clicked and played like a duo that had been performing together for years. Seek them out, if you haven't already. I first saw Robin with the Incredible String Band at the Bickershaw Festival and have seen him many times since. A unique performer of songs and stories. This shot was taken at Fylde in September 1995. Seen here accompanying Steve Knightley in January 2008, Jenna is a young North Devon based Singer Songwriter who was discovered by Steve. Many of her songs reflect and are inspired by her native Devon, and her voice and songs have already drawn comparisons with both Joni Mitchell and Sandy Denny. Multi award wining Chris Wood is an uncompromising writer whose music reveals his love for the un-official history of the English speaking people. With gentle intelligence he weaves the tradition with his own contemporary parables. His writing has been said to share the same timeless quality as Richard Thompson at his best. Alongside his work with Idlewild, Roddy Woomble has carved a successful career as a folk musician. He released his debut album My Secret is my Silence in 2006, collaborating with Kate Rusby, Ailidh Lennon, Karine Polwart and John McCusker. The album was critically acclaimed and reached the top spot in the folk charts. His work with Kris Drever and John McCusker as a trio has grown his army of fans and critics. (Kenny Speirs & Real Time) along with Kenny Speirs of the JWB and Judy Dinning of Jez Lowe's Bad Pennies. Watch out for their dates! December 2007 brought the 'big' band to Shaw Playhouse with John's final duo of Pete Abbott and Gregor Borland being joined by Joe Wright and Fraser Speirs as I witnessed one of his best gigs ever, sadly we lost John in February 2008 shortly after his unforgetable appearance at Westhoughton Folk Club's retirement party. In March 2007 as well as Pete Abbott John introduced the multi-talented Gregor Borland. Greg a multi talented addition to the band who thrilled fans throughout Germany and Holland when he toured with John for the first time in autumn 2006. Taken at John's 'Party-time' at the Worden Arts Centre, Leyland where John was joined by a number of special guests at what has become affectionately known as his Annual General Meeting. The 'band' line-up included Joe Wright, Pete Abbott and Ruth Angell from Ashley Hutchings' Rainbow Chasers. 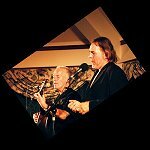 Joe Wright and Joe Topping formed John's band at Shaw Playhouse in December 2004 and what a splendid night it was with the two multi talented Joes adding superb musical and vocal accompaniment to John's vast repetoire. Terrific reviews wherever they played. Johns unique vocal style ably accompanied by Stewart Hardy's tasteful fiddle and Kenny Speirs driving guitar and vocals made this trio well worth a listen. Taken at Fylde in September 2000. Follow the picture links for individual shots of the band. A wonderful evening in the company of two of my favourites! Allan became John's 'Band' for the evening and John in turn provided stunning harmonies for some of Allan's songs. During the final song, the Shirelles 'Will You Love Me Tomorrow', Allan said "I don't want this to end" - neither did we! Their name, The Young’Uns, came from the nickname given to them when they started mixing in the local folk scene almost 10 years ago. For the last four or five years, the've has performed across the country and Europe with their mix of traditional folk songs and original songs. In 2012 they signed a record deal with Navigator Records in London joining top names such as Bellowhead, Bella Hardy and Lau . Regular visitors to Fylde, listen out for them!